Corian can provide beautiful countertops in any home or office setting. Corian is built to last, designed to inspire and able to be cut into just about anything. Arizona Countertop Repair and Finishing offers the best of the best in Corian repair and installation in Queen Creek, Arizona at prices that the Valley absolutely can’t beat. For over 30 years Arizona Countertop Repair and Finishing has been working with Corian and installing and repairing top of the line countertops in the greater Valley area. The benefit of Corian goes far beyond its aesthetic wonders. The reparability, as with any large investment like a kitchen remodel or even new flooring, is important to any homeowner. 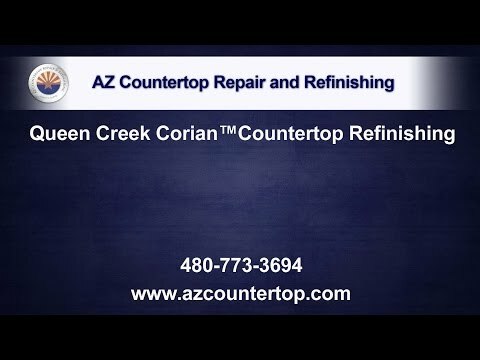 Corian countertop repair is simple and easy, if done by a professional like Arizona Countertop Repair and Finishing. Used for the design of luxurious looking countertops, Corian also makes a great bench top surface. Specifically engineered to resist stains, Corian is seamless, resistant to damage and easily repairable. It’s commonly described as something that lands between laminate and granite aesthetically and functionally. Many homeowners choose this material over others for it’s value and durability without the constant worry of scratching like you may encounter with granite or marble. We won’t deny that the wonderful world of pinning everything from shoe cleaning to ‘800 ways to use a pill bottle’ morphed into our clients wondering what else they can do with Corian in addition to revamping their countertops and turning their kitchen into a work of art. With the left over Corian from your recent install there’s plenty to do with the scraps. Because Corian is such a versatile material, what you create from the scraps can reach far beyond the boundaries of your kitchen. Think gardens, porches, craft rooms – it doesn’t have to be monogamous to the kitchen. You can absolutely make an owl-clock, of course you’ll need to brush up on your DIY clock-making skills, but Corian is a great material for executing just about any project. Depending on how fancy you want to get with a skill saw, anything from a plant stand, welcome sign, cutting board, coaster, trivet (or hot plate), picture frame, chessboard, an upscale TV tray or even re-do the top of your dresser for a quick and easy (and beautiful!) makeover. Throw some chalk-paint on top of your favorite Corian cut-out and it becomes and instant cheese-plate to serve at your next soiree. Another great idea may be to liven up your back porch by refinishing the counter top of your built-in grill, or creating entertainment-specific platters so it makes for easy clean up after a party. You’d want to start with a new, sharp blade so you don’t get snagged or ruin the Montana you’re about to cut out for your backsplash. Make sure to sand the edges – safety first. Since it is a soft(er) material, cutting Corian makes for an easy weekend project and you’ll be using your new Kokopelli-shaped cutting board in no time. Our advice is to definitely keep the cutting an outside project, don’t forget your safety glasses, and we’ve found that a 60-tooth blade on a circular saw works great for these kind of cut-out projects. It may sound obvious but create your design on the back of the scrap to avoid having to remove pen or pencil marks and create a ‘catch’ for the Corian you cut (this can be a buddy or neighbor instead of another table) so you don’t ding or crack the edges as the Corian is cut apart from the scrap. Get creative! Arizona Countertop Repair and Finishing has been exercising their creative muscle for over 30 years now, to bring the best service, expertise and countertop installation and repair to the valley. Contact us today for more information!